Teflon tape Teflon PTFE Adhesive Tape Runzhi selected high-quality imported wave fiber cloth, using a unique, sophisticated technology coating of PTFE resin, coated on one side made of pressure-sensitive silicone. And with a release paper rolls (corrugated and point two), is a high performance, multi-purpose composite materials, new products. Has excellent electrical properties, surface viscosity, corrosion resistance and low coefficient of friction. Widely used in food, pharmaceuticals, plastic bag, seal and other heat sealing packaging machinery parts and a variety of high temperatures, the anti-sticking, corrosion and other parts of the paste to use. Runzhi Teflon coated fiberglass cloth impregnated with PTFE (polyterrafluorethylence) dispersion and coated with high-temperature, pressure-sensitiv silicone adhesive. Top side provide good characteristics of PTFE, such as electrical characteristics, resistance, chemical resistance , low friction coefficient and non-adhesiveness. Flmae resistance make by insulating material can smoothly adhere, wind, band, and seal.It is widely used in aircraft industry, paper manufacture, food, environment, print and painting, costume, chemical, glass manufacture, medical, electronic, insulation, building (basic choth of topping frame), sharpener slice, machinery, etc. Runzhi selection of high quality PTFE Fabric substrate film last night, after a special surface treatment , single-sided adhesive and coated with silicone resin film prepared Teflon tape or adhesive tape with a backing roll. Coupled with high precision coating machine and cutting machine, enabling us to supply high quality and stable products. Teflon film tape is widely used in high temperature, acid, alkali, surface sticky roller close to the cladding axis thermal conductivity, low surface friction plate heat protection shield, plastic parts mold cavity wall Paste stripping, high temperature and pressure, connect the cable insulation wrap, high-temperature welding protection shielding of electronic components, thermal plastic heat sealing piece together parts of the paste. Easy to use, long life, good insulation, the adhesive tape suitable for -60 ℃ ~ 260 ℃ temperature range. Runzhi selects high quality Pure Teflon film, with a special treatment and then coating with high quality silicone adhesive to produce the PTFE film adhesive tape. With the special coating machine and accurate machine, we can supply the high and consistent quality product as per our clients requirement. The product is widely applied in the conduct roll for resistance of high temperature, acid, alkali and non-stain of the surface, protecting with the low friction of heating up flat, pulling off of the plastic model, joining and binding up cable of high temperature and high-pressure with anti-static, protecting wiht the electrical component jointing in high temperature, affixing of the hot plasticparts. It can be used conveniently, long-lived and have good insulation. 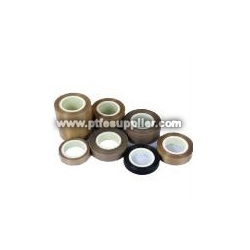 This tape can be well used in temperature range of 60 ℃ ~ 260 ℃.